McCall Family Dentistry has passionately served the Fox Valley for over 40 years. These four decades of diligence have given us the knowledge to provide you with a top-notch dental experience. Patient and family focused, Dr. James McCall , Dr. Ryan McCall and Dr. Kyle Harmon understand that offering you a comfortable space is just as important as the services they provide. We offer a variety of general, restorative, and cosmetic services, including bridges, crowns, teeth-whitening, and Invisalign® Clear Braces. Beyond our services, we’ve also equipped our treatment rooms with flat screen TVs, Bluetooth headphones, surround sound, massage chairs, and state-of-the-art dental equipment, including digital x-rays, to provide you with an overall excellent experience. As our patient, you are our most valuable asset, and we strive to develop long-lasting relationships with each of you. We appreciate your referrals and look forward to seeing you! McCall Family Dentistry is the finest in the Fox Valley. Welcome to McCall Family Dentistry! For over 40 years, our family has been providing Geneva families with high-quality dental care in a warm, friendly, and modern environment. We’re also proud to serve the surrounding communities of Batavia, St. Charles, Elburn, Aurora, and Elgin. Drs. James and Ryan McCall offer a wide range of services for both adults and children, designed to take care of all your dental needs under one roof. At McCall Family Dentistry, your comfort is our top priority, and we find that our patients appreciate the attention to detail offered at our office. You can relax during dental procedures with your favorite movie on Netflix and cover up with a warm blanket. We also utilize the latest dental technology to make your experience pain-free. You’ll find state-of-the-art equipment at McCall Family Dentistry, which helps make your treatment procedures as stress-free and comfortable as possible. Dr. Jim and Dr. Ryan believe in keeping up to date with continuing education and new equipment so we can deliver the most pleasant experience possible and exceed your expectations every time you visit us. McCall Family Dentistry is truly a family-focused dental practice. Dr. Jim and Dr. Ryan are father and son, while Sarah and April, our long-term dedicated team members, are mother and daughter. 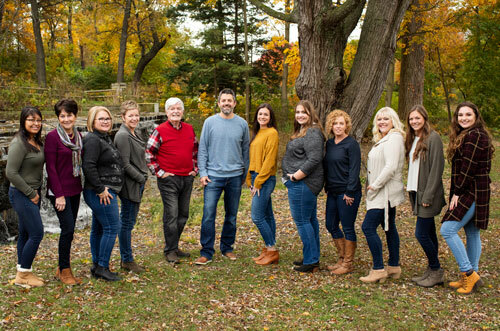 Dr. Ryan’s wife, Lindsey, is also the marketing and accounting manager for the practice, so as you can see, we have a long-standing family tradition! 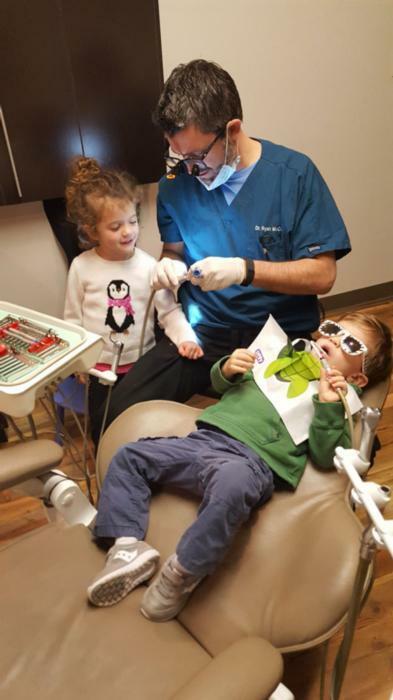 We welcome patients of all ages to our practice, and we start seeing little ones between the ages of two and three years old, unless parents have concerns early on. We know how important these first visits are for children, and that’s why we strive to keep our time with your child positive and upbeat. We also offer additional services for children designed to build and protect small teeth such as fluoride treatments and dental sealants. For adults, whether you need your teeth cleaned, repaired, or updated, our doctors have got you covered. With over forty years of experience between them, you can rest assured that you’re working with dental experts. We use the finest dental materials and work with only the top laboratories in the area to ensure that you receive restorations you can trust and be proud of. We know you’ll appreciate the differences you notice when you choose McCall Family Dentistry as your dental home. Our patients love the personalized care they receive from our entire team, and this is how we’ve built our reputation over the years. We can’t wait to welcome your family into ours, so give us a call today to schedule your next appointment! Our Patient Center makes it so easy for you to make an appointment or contact us with any questions you may have. Follow our blog to stay up to date with the McCall Family Dentistry Team and all the latest advancements in dentistry. Come by and take a look at how comfortable your dental experience can be with McCall Family Dentistry.